The so-called refugee crisis affecting Europe, as Syrians flee the war zone created by Western states supporting a violent "transition" to fake democracy in their country, is not sudden or unexpected. As one columnist argues, it is deliberate and coordinated propaganda. According to Steve Topple, writing at Middle East Monitor (MEM) at the very end of September, the supposed crisis may be "stage-managed" to justify more Western involvement in the Syrian Civil War. This involvement is ultimately aiming to remove President Bashar al-Assad from power, which the United States has been attempting to achieve since 2006. In essence, Western countries have deliberately and maliciously created the refugee "problem" they are now swooping into action to solve. Facts show that only a fraction of the refugees are Syrian and that many others come from other regions affected by US-led Western wars to spread fake democracy in the Islamic world. Western leaders have portrayed the cause of the refugee problem as ISIL (ISIS, Islamic State, Daesh), rather than Western support for terrorism in Syria, thus suggesting ISIL is their main target, but the real goal of all Western involvement in Syria is to remove the government of Bashar al-Assad. Topple refers to the Wikileaks document exposing how such 'regime change' was US policy throughout the entire crisis and even earlier in 2006. 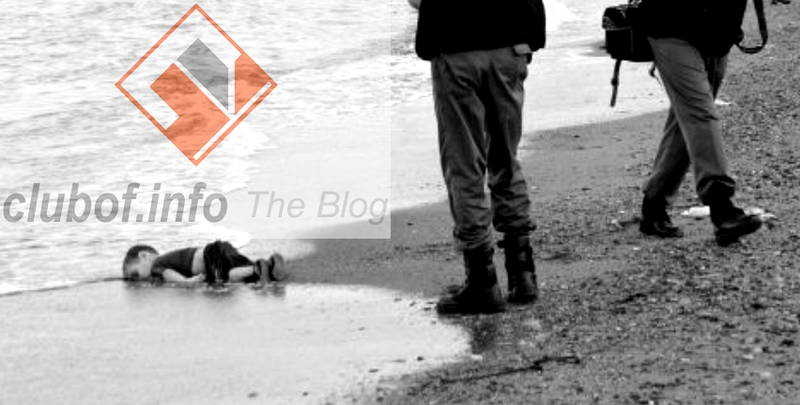 While UK Prime Minister David Cameron has cried crocodile tears with his statements in the media for Aylan Kurdi (pictured), a Syrian refugee boy who washed up on European shores after drowning in an attempt to reach the continent, "megalomaniac" Turkish President Erdogan does nothing to help the refugees. Erdogan's main goal has instead been to enlarge his tiny "no-fly zone" in the north of Syria, which he sees as a great military conquest over Syria and the Kurds by Turkey. Topple pointed out that the so-called "Friends of Syria", which includes the Erdogan regime, are cynical devotees of the war in Syria and have no compassion for the Syrian people, supplying nothing but weapons into the embattled country. War has raged in Syria since Western governments started the Civil War in the country in 2011 to remove President Bashar al-Assad from power. Since that time, these governments have used every channel to lie about the existence of non-extremist armed militants fighting the government, while allowing weapon supplies to reach ISIL and other Takfiri extremists fighting Assad's forces.